The factors exp(xi/4) xi in Eqs. 24 and 25 accounts for the interconnecting hardware. The innovative problem was presented by Tillman. The problem's objective function has been appropriately modified to combine multiple objectives related with the components. Moreover, a self adaptive penalty function is embedded also in function of objective consequently best solution is searched effectively and efficiently by the penalizing in-feasible solutions. 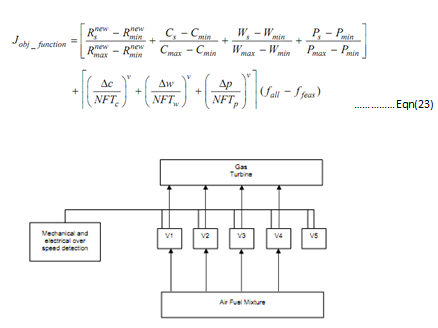 For the five stage sequence gas turbine system the input data is describe in Table no.4. To implement the customized Particle Swarm Optimization algorithm in aforementioned reliability optimization problem and a solution string, represented in diagram, has been constructed here, xi,j = Number of redundant component j utilized in subsystem i. In order to implement the Particle Swarm Optimization algorithm in the aforementioned Gas turbine system illustrated pseudo-code described in Programme no.4. // compute velocity of particle using chaotic random generators. Programme no.4: Pseudo Code for the Particle Swarm Optimization Applied to the Reliability Optimization Problem or ROP.